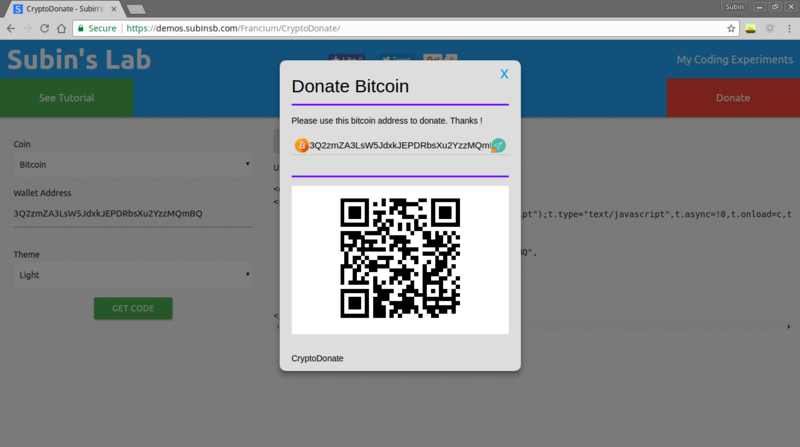 You can simply add the CryptoDonate widget to your blog or site by using this Widget Maker Tool. The widget maker tool generates a script that will load the files asynchoronously meaning your page’s load time won’t be affected. The Fr.loadCD() function is used to load CryptoDonate to an element. It’s first parameter is the element (can be an element ID or element DOM object). The second parameter is the options. To the second parameter, you can pass the same options as you pass to CryptoDonate object. Notice the sub-object strings. It helps you to change the text displayed. You can use another language or change the "donation" to a "Pay Now" button. The address to which payment is made. This value will be in different format for different coins. CryptoDonate does not check whether it’s valid or not. Make sure it’s correct. Should the QR image be displayed or not. The callback function used to get the URL to QR image representation of the given string. The strings that are displayed to the user is stored in this object. This is useful for translating strings. The base URL from which resources are loaded. The folder structure of base folder should be like this. Should the button be large sized. Additional classes that must be added to the button. The classes must be separated by a whitespace. If ‘dark’ class is added, then the button’s theme will be changed to dark. Similar to buttonClass, it adds additional classes to dialog. Can be used for theming the dialog as well.